The Concordia Stingers men’s and women’s soccer teams split a doubleheader with the Université de Sherbrooke Vert et Or on Sept. 23 at Concordia Stadium. The men’s team won their match 6-0 while the women lost 2-1. The Stingers made a statement with the win, putting up the largest margin of victory in the Réseau du Sport étudiant du Québec (RSEQ) division this season. They improved to 2-2-0, moving into a playoff spot. The Stingers created chances right from the get-go. Vert et Or goalkeeper Guillaume Proulx made a few key stops in the opening half hour, frustrating the Stingers offence. The men’s team now has a record of 2-2 this season. Photos by Alex Hutchins. The Stingers forwards pressed hard on Sherbrooke, and midfielder Omar Abdelfadel created a turnover deep in the attacking half. The ball found its way to forward Mitchell O’Brien in the box, who spun around and took a shot towards the far side of the goal. Proulx could do nothing to stop the sensational goal. Midfielder Amadou Lam scored on a penalty five minutes later, and the Stingers were up at the half 2-0. 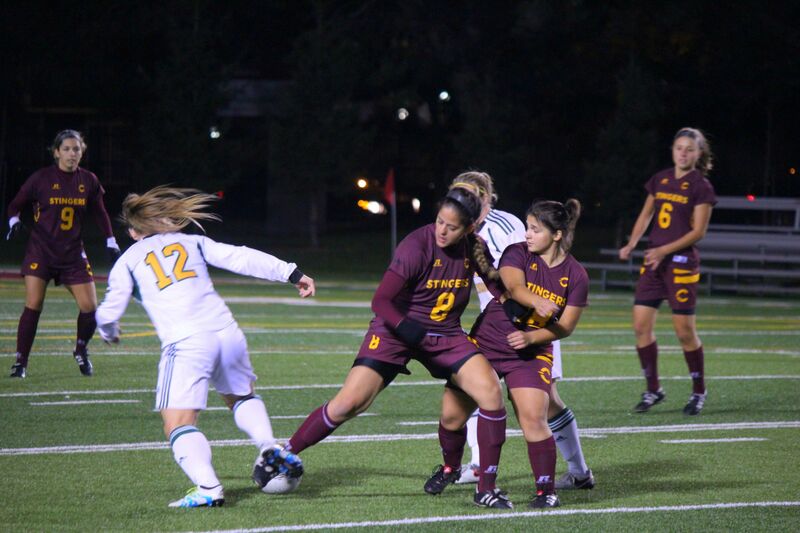 The Stingers continued pressing for goals throughout the second half. Eight minutes into the frame, Stingers forward Sebastien Boucley took a pass from forward Gabriel Quinn in the box and tucked the shot away to make it 3-0. In the 73rd minute, Stingers defender Antonio Bruzzese crossed the ball into the scoring area, and after the keeper mishandled it, Boucley was right on the doorstep to put it away. The Stingers added two late goals from Quinn and Boucley, who got a hat-trick. Goalkeeper Karl Gouabé, who has been named the Male Athlete of the Week the past two weeks, made four stops. This was his first shutout off the season, which was important for head coach Greg Sutton. “The biggest thing was that defensively, we kept the zero on the scoreboard,” Sutton said. The women’s team followed up the men’s game with a heartbreaking loss at the hands of the Vert et Or. The team had their chances but came up short in the 2-1 loss. The start was not optimal for Concordia, as the official awarded the Vert et Or a penalty shot nine minutes in. The Vert et Or capitalized on their opportunity and took an early 1-0 lead. The rest of the first half was rather stagnate, with little chances from either side. The Stingers did build up some attack, but were often called offside. The second half did not start ideally for the Stingers. Under two minutes in, Sherbrooke forward Christina Arès-St-Onge blasted a shot from outside the box into the top corner. It was a deflating goal that would have taken the life from most teams, but not the Stingers. The women kept their heads held high, and their spirits were lifted when forward Mélisane Lafrenaye—a former Shebrooke player—airmailed the ball 30 yards into the back of the net. It was a goal of pure class that kept the Stingers in the game. “We got the goal and it just gave us life,” Stingers head coach Jorge Sanchez said. The Vert et Or attempted to regain their two-goal lead, but their offensive chances were shut down by the stellar Stingers defence. Stingers goalkeeper Olivia Desgroseilliers made a fantastic save in the 66th minute that kept them alive. The Stingers had multiple chances from the 80th minute onwards, but did not get any goals out of it. Both teams play at the Universite de Québec a Montréal on Sept. 25 before hosting Laval next Friday on Sept. 30.